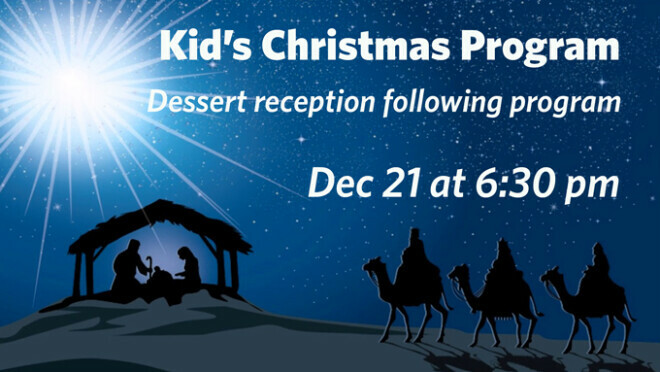 All children, ages Pre-K through 8th grade are invited to participate in our annual Christmas Program on Friday, December 21 at 6:30pm in the Worship Center. If you are interested in participating, please come to the Parent Meeting and First Rehearsal on Sunday, December 2, 12-1pm in the Worship Center. All are invited to attend the program. It's the perfect way to start celebrating Jesus' birth. Come see the Christmas story, told by children in full costume. Enjoy singing along with classic Christmas carols. A dessert reception will follow the program.